Get ready to spend a day at the ballpark, watching your favorite team slug homeruns over the Green Monster. Click here to play! 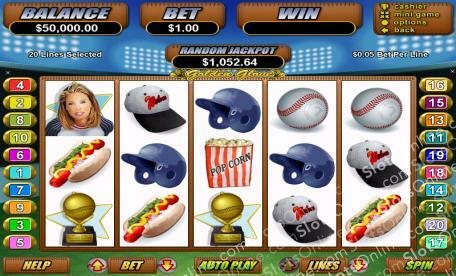 Put on your lucky cap, grab some popcorn and hotdogs on the way into a baseball game that will see you winning right along with the teams. Keep your eye on the Batter. He only appears on reel 1 but he substitutes for all other symbols and your prize money doubles anytime he appears in a winning combination. The Catcher is another key player in your game, earning you up to 2500 times your original line wager. Two to five baseball gals will win you up to 1250 times your original wager, and five umpires will get you 500 times your bet. There are a variety of other symbols that will help you score a win. Baseball wouldn't be anything without the ball or hats. Watch out for batting helmets as well because three to five of these will pay out up to 300 times your wager. Of course, no day at the game would be complete without ballpark food. But rather than spend your hard earned dollars on snacks, these hotdogs and popcorn will pay you. Take yourself to the ballpark and watch as each run puts money into your pocket! Golden Gloves operate as scatter icons. Two or more of these anywhere on the board will pay out 100 times your total bet (200 times if accompanied by a Batter). The Home Run Feature is activated when you get three or more Golden Gloves. You will be awarded nine free games. If, during these games, you get the letters H, I, or T on reels 2, 3 and 4 will award a 1,2,3 or 4 base hit. For each run scored, you will be awarded double the prize money and earn one game in the Grand Slam feature. All prizes during the Grand Slam are multiplied by five. The Batter in uniform, taking a swing, acts as the substitute symbol. This guy will replace all other symbols, including scatters. He also doubles all prize money when he appears in a winning combination.